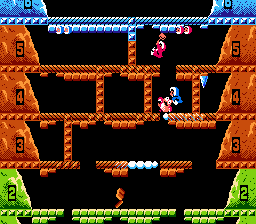 NES Ice Climber (USA) in 18:26.39 by Alyosha. This movie completes the 32 mountains of Ice Climber very fast. It catches the bird in every bonus stage, which almost doubles the movie length (partly due to longer bonus countdowns after the stages). It's not a very exciting movie as a whole, but due to how hard the character is to control, the game is difficult to beat by normal playing. This movie by Alyosha improves the previous run by over a minute due to better optimization and more use of glitches that let a player pass through some unbroken ceilings.